Material and Finish: Powder coated “raven black” steel posts with maple wood top rail. Description: Double Stringer Stair with out Ithaca Style cable railing and custom floating staircase. Wood Treads and Handrail made of maple. We fabricated this custom floating double stringer stair and Ithaca Style cable railing for this timber frame home in Connecticut. The home has a casual elegance and the stairs were designed to blend well with that. 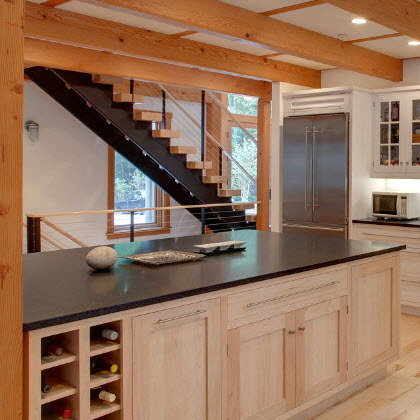 To complement the heavy Douglas Fir beams , we made the treads from solid 16 quarter Maple and finished with a baked on high performance varnish to withstand years of use. A neat design detail was to slice the edge of the tread with the railing posts creating sort of a knife handle effect. The stair stringers are made of rectangular steel tube with laser cut tread supports welded to them. This provided a sturdy look that was proportional to the heavy timber treads that were selected. There are 2 nearly identical stairs, one over the other which are both visible from the gourmet kitchen and at the entry of the home. The Matt Raven black finish was selected to play well with the black quartz counters in the kitchen. The matching railings extend down the stairs and across the bridge past the massive Tulikivi soapstone fireplace. Where possible we used lag cable fittings to connect directly to the timbers of the home. We think cable railings are right at home with this type of architecture.